Cedar Point Memories – Part 15 – Pirates! Postcard scan from this site. I’m all screwed up on the timeline on getting these articles in order. So for the moment I’m going to throw the order aside and write about a beloved Cedar Point ride that no longer exists. The ride is “The Pirate Ride” and it was located next to the Blue Streak. It was a pirate themed dark ride. For those not familiar with the term dark ride, here is the definition from Wikipedia. A dark ride is an indoor amusement ride where riders in guided vehicles travel through specially lit scenes that typically contain animation, sound, music, and special effects. A dark ride does not have to be dark. They are enclosed, so all illumination is artificial, and most use special lighting to achieve theatrical effects. Selective use of darkness helps hide the ride mechanisms and increase the visual drama of the experience. Disney’s It’s a Small World is an example of a brightly lit dark ride. 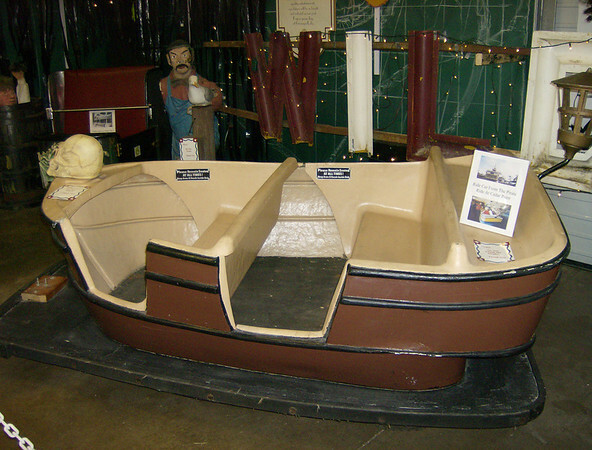 Dark rides used to be very popular in the United States, unfortunately very few exist outside of Disney these days. The only other dark ride that I rode at Cedar Point was Earthquake. That was removed in the 1980’s. If you search Google there are many sites dedicated to dark rides. There are also groups that are as fanatic about dark rides as some people are with roller coaster. 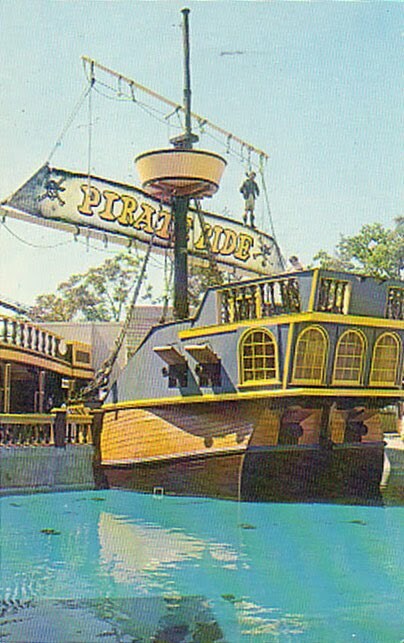 The Pirate Ride was built in 1960 at Freedomland, USA a theme park in New York. It was purchased and relocated to Cedar Point in 1966. Once at Cedar Point it became a fixture until it’s removal in 1996. In the eighties there was water around the outdoor pirate ship. Sometime in the late eighties or early nineties it was filled and just normal concrete and landscaping was around the structure. In my early twenties I was heavy into the haunted house group in my home town. I can tell you that almost everyone in that group mourned the loss when it was gone. This was pre-“everyone on the Internet” so it started as rumor and made it to sad fact in 1997 when it was no longer open in the park. I can say that this was my third favorite ride to ever exist in the park. The first is the Paddlewheel. The second is the Gemini. When I was a kid I loved climbing up on the mock pirate ship in front of the ride and pretending that I was a pirate. It was one of the greatest things at five or six years old when you are pretending to blow other Cedar Point guests off the face of the planet. I was steering the ship on the high seas and loving it. This was all before Jack Sparrow made being a pirate cool. Because only a maximum of four people could ride in each car there was almost always a bit of a line. The ride was also packed when it was raining. When it was hot the inside of the ride was a bit cool. All around it was relaxing and as far as I remember almost always regularly in use. It had that nice skull on the front. If you had souvenirs or bags they slid perfectly on the back of the car. Seriously these the best designed ride car of anything they had in the park. It was easy to get in and out of. No pesky seat belts to worry about. It was just right. The Pirate Ride Mural from boarding area – from this thread (click for larger version). I can say that I did break the rules with this ride. I did touch a few attractions showing off during the ride. I believe I have stood up on the ride. We had a chinese in fire drill on the ride once with the car behind us. I did have “make out” session on the ride. I did not actually smoke on this ride (seriously this time). How we got away with all that, I’m unsure. There were camera’s everywhere in that ride. Maybe the operators were just asleep at the wheel. We just got more and more brazen on what we did. We also knew that when we saw the skeleton at the end we had to put on our little angel halos. What was terrible is when the ride was really busy (such as when it was raining), because you had to ride to strangers if there was only two people in your party. When this happened we also placed our halos on. Though I think one of the chinese fire drills we did was with complete strangers. You just had to feel the people out. We never wanted to make our good time interfere and give anyone else a bad time. Surprisingly enough I did find a video ride through of the Pirate Ride. Once again it is a dark ride, so we forgive any quality issues. We are just happy to have this little memory. For those interested in reading more about the Pirate Ride, I guess it inspired the Pirate’s of the Caribbean ride at Disneyland. You can read an article with more about the Pirate Ride history here.